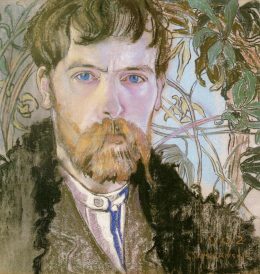 Stanisław Wyspiański was a Polish dramatist, painter, and poet and is widely regarded as the father of modern Polish theatre. He was a central figure in the Young Poland movement. His plays and artwork fuse contemporary artistic trends such as modernism and symbolism with Polish folklore and patriotism. Born in 1869, Wyspiański grew up in Kraków, where he attended St. Anne’s Gymnasium. He later studied at the Jagiellonian University and the Kraków Academy of Fine Arts. His teacher was the patriotic Polish painter Jan Matejko, known for his large oil-on-canvas works commemorating notable events in Polish history. As a schoolboy, Wyspiański wrote a drama based on Matejko’s painting Báthory at Pskov, which depicts the Russians kneeling before King Stefan Báthory. Wyspiański’s first major works were his murals and stained-glass windows designed for the Church of St. Francis, a church in Kraków that dates back to the thirteenth century. The murals blend floral and heraldic designs with geometric patterns. 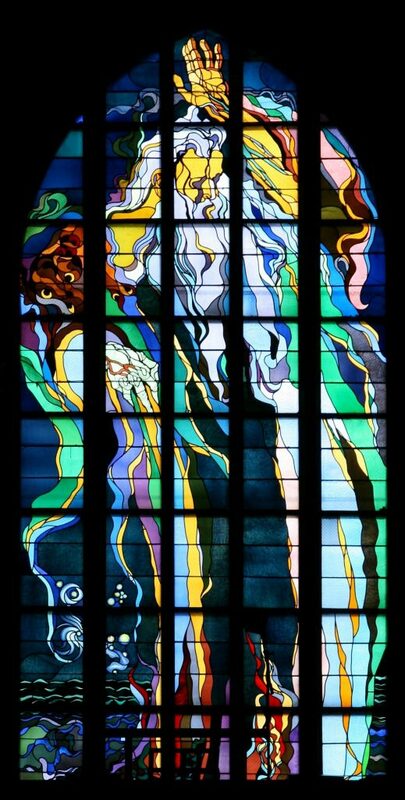 The stained-glass windows are striking, particularly God the Father—Arise!, which depicts God creating the universe from chaos. At around the same time, he collaborated with Matejko on the restoration of St. Mary’s Basilica. He also made designs for stained-glass windows in Wawel Cathedral depicting Saint Stanisław, Casimir III, and Henry II. Wyspianski’s breakthrough came with his play Wesele (The Wedding, 1901), which remains his most famous work. The play is centered around the wedding of a Cracovian intellectual and his peasant bride. In the second act, the guests at the wedding are visited by ghosts of figures from Polish history and legend. The play concludes with the loss of a golden horn bequeathed to the Host by the ghost of Wernyhora (a legendary Cossack bard who is said to have prophesied Poland’s fall and rebirth) and the guests’ hypnosis at the hands of straw mulch. Wyspianski’s intention was to satirize the passivity of Polish intellectuals and their failure to actively involve themselves in the nationalist struggle. His assessment of the political situation is pessimistic, but the play is ultimately a call to arms for Poles to fight for Poland’s statehood. Austrian, Prussian, and Russian censors feared the play’s potential to incite rebellion, and references to Polish nationalism were censored in the premier performance in Kraków. The entire play was censored in Russian-occupied Poland, which was then still suffering from the aftereffects of the January Uprising, an unsuccessful military insurrection staged against the Russian Empire in 1863. Following the January Uprising, the Russian government strengthened its stranglehold on Polish culture by liquidating Polish schools, churches, theatres, newspapers, etc., confiscating Polish estates and banning the Polish language in schools. The most potent symbol of Poland’s misfortune under foreign rule was Wawel. Wawel Hill is the site of the earliest known settlement in Kraków and was established in the fourth century. Some structures dating back to the tenth century are still standing. In the eleventh century, Wawel became the formal seat of the Polish monarchy. Wawel Cathedral was made the coronation and burial site of Poland’s monarchs. Wawel fell into a state of decline under foreign occupation. Austrian troops converted the site into barracks and demolished some buildings on the complex. The Prussians also looted the royal insignia. Poles attempted to reclaim Wawel by burying national heroes there, such as Tadeusz Kościuszko and Adam Mickiewicz, whose remains were repatriated there in 1890. This collection also includes notes on Wyspiański’s architectural plan for Wawel. Toward the end of his life, Wyspiański collaborated with the architect Władysław Ekielski to design an (unrealized) plan for Wawel that would revive its ancient glory. Wawel was to be the home of the National Museum, the Polish parliament, and the Polish Academy of Arts and Sciences, as well as an amphitheatre and the reconstructed churches of St. Michael and St. George (which had been demolished by the Austrians). Wyspiański’s amphitheatre on Wawel Hill was to be the site of public performances of dramatic works. Open-air staging was a major component of his idea of “monumental theatre,” which he introduces in his essay on Shakespeare’s Hamlet. Wyspiański strove to unite all of the arts in his work and to involve himself in each creative realm. He designed the sets and costumes for each of his dramas. The only art in which he lacked expertise and formal training was music. Nonetheless, according to Kraszewski, his plays are written in lyrical verse reminiscent of Polish folk ballads. The English reader gets a taste with these translations. Wyspiański was also influenced by classical mythology and drama. Four of his plays retell classical myths: Meleager (1897), Protesilas i Laodamia (1898), Achilleis (1903), and Powrót Odysa (The Return of Odysseus, 1907). 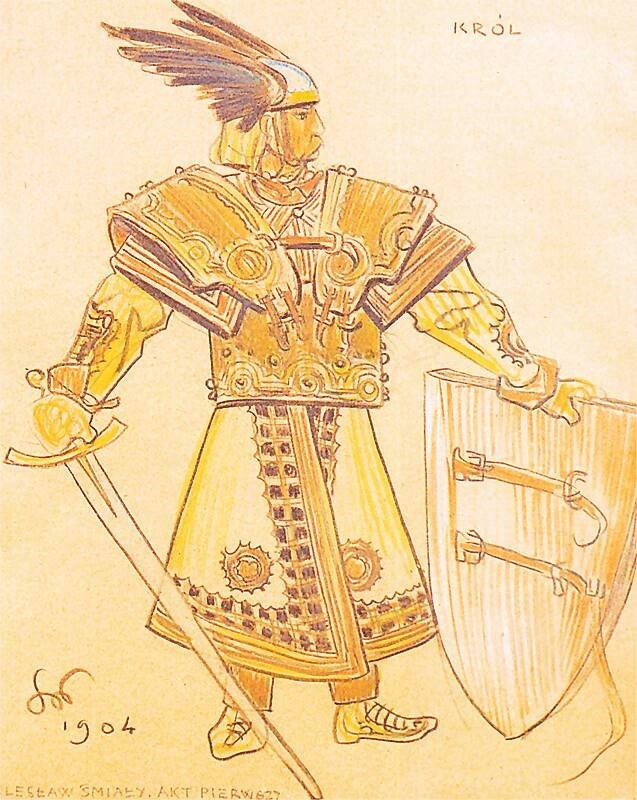 He also provided fifteen illustrations for Lucjan Rydel’s bilingual edition of the Iliad. His architectural conception of Wawel was inspired by the Acropolis of Athens; he christened it the “Wawel-Akropolis.” His design for an amphitheatre blends Polish architectural elements (as seen in the Krakow Barbican) with Greek architecture. 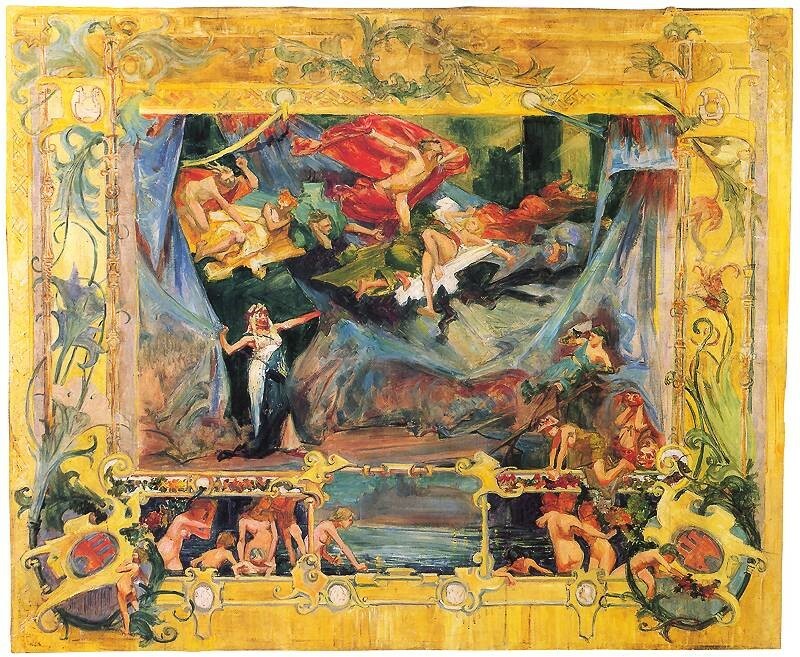 The influence of Wagner and the Wagnerian notion of nation-building through drama is evident in his first play, Legenda (1897), and its later revised version, Legenda II (1904). Legenda II is the version in this collection, here retitled Wanda. The plot centers around the myth of the legendary Princess Wanda, a Joan of Arc figure who (in the play) halts a German invasion and then drowns in the Vistula river. Wyspiański originally envisioned it as an opera and began writing a libretto on the subject in 1892 with the hopes that the Polish composer Henryk Opieński would write the music. The play opens with the death of Krak, Wanda’s father, and the invasion of the Germans. Wanda prays to the Slavic goddess Żywia (Živa) for the strength necessary to defeat the Germans. In return, she sacrifices a doe and then vows to sacrifice herself as well: “I choose death, that my folk retain / Their freedom.” Wanda uses her newfound strength to cause an outbreak of lightning, and the Germans are paralyzed and begin their retreat. Krak’s funeral resumes, and some rhapsodists play songs of lament on the rebec. They then begin to hallucinate and see a band of warriors in shining robes. Suddenly, water maidens emerge from the Vistula led by a shaman, and a shepherd appears, accompanied by more water maidens, werewolves, fauns, and ram-headed men. It is explained that Krak (for whatever reason) destroyed a sacred altar and defamed the gods. He is ceremoniously disrobed of his kingly attire, which Wanda dons. The water creatures place a wreath on her head that will give her the strength she needs to finally vanquish the enemy. The Poles are victorious, and the nation gathers on the banks of the Vistula to celebrate their victory and crown Wanda king. During the ceremony, Wanda’s raft begins to sink as the water creatures beckon her to the depths of the Vistula, urging her to take off the magic wreath. Wanda refuses to take it off and then drowns. Wyspiański draws a parallel between Wanda and Queen Jadwiga by having the people crown her as “king” instead of “queen.” This is likely an allusion to Jadwiga’s rejection of the Austro-Hungarian Empire and subsequent marriage to Jogaila, Grand Duke of Lithuania (Władysław II Jagiełło), which would have resonated with Poles in Austrian-occupied Kraków. Jadwiga was initially betrothed to William, Duke of Austria, but Polish noblemen strongly opposed the betrothal and drove him out of Wawel Castle. Bolesław Śmiały (Bolesław the Bold, 1903) and its sequel Skałka (The Rock, 1907) depict the conflict between King Bolesław and Stanisław Szczepanowski, Bishop of Kraków. Bolesław reigned from 1076-1079, and Stanisław served as Bishop of Kraków from 1072 until his murder on April 11, 1079. Bolesław Śmiały is set on Wawel Hill, while Skałka takes place in the Church of St. Michael. Kraszewski combines the two into a single play, as there is evidence that this was Wyspiański’s intention. But Bolesław is surrounded by traitors: Władysław, his brother; Sieciech, Władysław’s court palatine; Krasawica, his once-loyal mistress; and Stanisław himself. He is also a tragic hero, blinded by his own flaws. He thirsts for worldly power and disregards the spiritual realm, as represented by Stanisław. (Kraszewski observes that Stanisław is less a symbol of Christianity here and more a symbol of the supernatural/spiritual in general; he is actually shown to be sympathetic to paganism, and he and the pagan Rhapsode are allies by the end of the play.) This proves to be his downfall. After murdering Stanisław, he is killed at the end when Stanisław’s silver coffin falls on him. The titular play of this collection, Akropolis (1904), is a paean to Wawel Hill and its sacred significance for the Polish nation. The characters in the play are all statues and figures from tapestries in Wawel Cathedral who magically come to life on the night before Easter. They include characters from the Iliad, some Biblical figures, and angels from St. Stanisław’s coffin. They are later joined by King David, who descends from the choir loft when the clock strikes three and sings a psalm foretelling the apocalyptic destruction of the cathedral and praising the sun. The personification of night arrives and is followed by Aurora, who ushers in the dawn. Kraszewski points out that Paris boasts at one point that he bears the golden fleece, which could be a subtle way of associating servility toward the Austro-Hungarian Empire (symbolized by the Habsburg decoration of the Golden Fleece) with the cowardly character of Paris. From off her bended knees. Were all her toils and tears. Her kings sleep, as does their right. Once, and again, His scroll. There is currently an exhibition at the National Museum in Kraków displaying around 500 of Wyspiański’s works: http://mnk.pl/exhibitions/wyspianski . According to legend, a sentry on a tower of the church began sounding St. Mary’s Trumpet Call in order to alert Kraków of an incoming Mongol invasion in 1241. The city gates were closed before the Mongols arrived, but the sentry was shot by an arrow before he could finish the tune. This is commemorated to this day by the playing of the trumpet call every hour. The first is Stańczyk, the patriotic court jester immortalized in Matejko’s famed painting of him, in which the solemn Stańczyk mourns the loss of Smolensk while others celebrate in the background. He accuses the Journalist (one of the guests) of passively acquiescing to Poland’s fate and hands him his jester’s marotte, urging him to galvanize the people. The Poet (another guest) sees Zawisza Czarny, a renowned Polish knight and a symbol of Polish military glory. The next apparitions are traitors and contrast with the earlier two. The groom sees Franciszek Branicki, an aristocrat known for his corruption, greed, and arrogance. A peasant sees “the Devil,” a representation of Jakub Szela, who led a pro-Austrian peasant uprising against the Polish gentry in 1846. Stephen Muir and Anastasia Belina Johnson, eds., Wagner in Russia, Poland and the Czech Lands: Musical, Literary, and Cultural Perspectives (London and New York: Routledge, 2016), pp. 155-56. A reference to Zygmunt Krasiński, who is regarded as one of the Three Bards of Polish Romantic literature along with Adam Mickiewicz and Juliusz Słowacki. Wyspiański is sometimes referred to as the “Fourth Bard.” In Krasiński’s epic poem Przedświt (Predawn, 1843), he puts forth a messianic view of Polish history and predicts Poland’s rebirth.